Fantasy writer Terry Pratchett and science fiction novelist Stephen Baxter may hail from different genres, but the two men are well-matched for the sheer size of their imaginations. In addition to stand-alone favorites like Good Omens, Pratchett has penned 39 novels in his best-selling series, Discworld, a fantasy universe populated with bizarre citizens and satirical plotlines. Not to be outdone, Baxter has authored more than 40 books, with the plot of his epic Xeelee Sequence series beginning with the Big Bang and spanning to billions of years in the future. 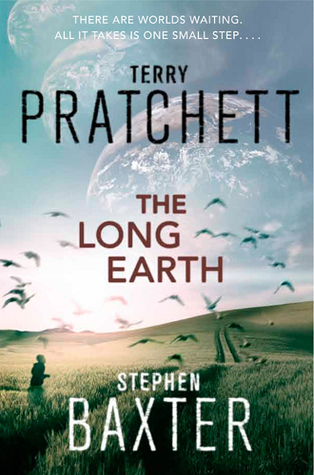 Pratchett and Baxter's joint project, The Long Earth, is unsurprisingly large in scope. In this science fiction novel, a rogue scientist invents a game-changing device that allows any amateur operator to "step" sideways into a parallel version of the earth. The number of parallel worlds is unknown, and a massive land grab begins as the human race fans out, stepping "east" or "west" away from our own world, "Datum Earth." In the chaos, children go missing, national borders are challenged, and "natural stepper" Joshua Valiente—who can move between worlds without technology—embarks on a journey of unknown length into the fathomless "Long Earth." Pratchett and Baxter chatted with Goodreads about the future of science fiction and the "very real" possibility of making contact with aliens. Goodreads: The science fiction premise at the heart of The Long Earth impacts the entire world population. Can one of you briefly explain the concept of quantum earths? Stephen Baxter: Over to you, Terry! 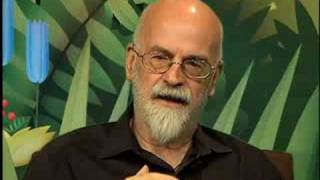 Terry Pratchett: [laughs] You're the bloke who knows about quantum. I'm the bloke who knows about faeries. SB: [The quantum earths idea] is what Terry started with in the early outlines of chapters. It's the opening up of the "Long Earth." It's a bit like the dream of the old west, the endless frontier, because the other worlds are like ours but without humans, and they go on forever as far as we can see, one after the other after the other. It's an expansion on the frontier and how that shapes our humanity. GR: With our own Earth struggling to support a growing population, the prospect of unlimited space is appealing. TP: Ever since we came out of the caves it was all about scarcity, fighting others because there wasn't much to go around. Unless we get a quantum earth, we could be doing that again. [These characters] are in an endless earth, and there is enough for everybody. Everyone can have an earth of their own, and one for the wife as well, and another two for the kids. SB: It gives you choices. Do you want to live in a city? If so, why? There are things that cities give you, but they need a concentration of people to support them. Taking off the resources constraint opens up all sorts of possibilities. For most of history, let's face it, we humans have lived like nomads, scattered over gigantic landscapes. In a way, it's back to the past. GR: Terry, when did you begin the book, and how did the collaboration with Stephen come about? TP: After The Color of Magic  was sent to the publishers, I was wondering what to do next. I started an elongated short story about the quantum earths, and I had a vague idea that I could turn it into a novel. I once drove past a pub in Bristol, England, and I saw a horse being pushed through the pub door, and I thought, "Why is that happening?" I started off with a man who just found a way of getting into another world, and he was more or less taking a Noah's Ark through with him, putting pigs in and so on. How it happens is, you get the ideas and you play about with them, you take them where you think you want to go. But The Color of Magic became very successful quite fast, so I thought this [short story about other worlds] looks like an SF book, not a fantasy book. Since fantasy is doing well, I'll write another fantasy book. So in fact, the acorn that was going to be The Long Earth laid there in my cupboard in my office for quite a long time. Steve and I have known each other for a long time, because every time you go to an SF convention you're bound to meet each other. I thought he was the best hard-core SF leader we had in the UK. We were sitting together at a party, and I asked him if he would like to have a go at this, and that was it, really. SB: I think we've known each other for 20 years now. At first we were just playing around with the idea of collaborating for The Long Earth. We kind of got carried away. GR: What were the advantages and pitfalls of cowriting a novel? SB: It was an interesting clash of styles. There were some interesting moments—various hissy fits, tantrums. TP: I think it was one hissy fit each and one shared. SB: Terry would start with the characters, and let them work out their own story in a way. Whereas, coming from a hard SF background, I'm more used to working out timelines and maps and trying to map out the universe we're going to explore conceptually. TP: Folks, he actually turned up with some spreadsheets! SB: And a box file with maps. Terry was appalled. TP: I was impressed at first, then appalled. I think twice when we were working—especially when we were doing the last draft—one of us would say to the other, "You did a pretty good job on that bit," and the other one would say, "Hang on, you wrote it." We were actually cleaning up after one another, gluing things together in the right places, but still keeping the same mood. GR: If a stepping device to travel between worlds were discovered tomorrow, would you use it? SB: Having thought this over hard, I would use it, but I would be very careful about where I was stepping over into, given the wildness of the earths next door. It's not necessarily saber-toothed cats that will get you; it's the mosquitoes on boggy land. You could land in the middle of the forest or in the middle of an ice age. I think we've lost track of how much our world has changed, especially in England to be honest. You have 6,000 years of cultivation of one kind over the other, forests were cleared 2,000 years before Christ, and so on. I think I'd take a quick look and get out—with a guide! TP: You step, but you keep one finger over the button. SB: Yes, to send you back again. GR: And if you had invented the stepping technology, would you have shared it freely with the world, as the character of Willis Lindsey did? TP: Not immediately. Let's put it like that, in my case. SB: That's a good question, isn't it? I suppose we live in an age where people believe in free access to stuff. The default position is to share it with the world. It is irresponsible—as we show in the first couple chapters—kids stepping out of high-rise buildings, plummeting 50 feet. You want to avoid those kinds of problems and the long-term implications and economic impacts. On the other hand, the alternative is a corporation controlling it, which is what Lindsey wanted to avoid in the book. In the end, it's going to leak out. 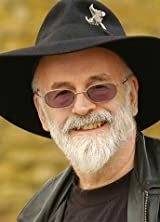 GR: Goodreads member Kenia Lockhart asks Terry Pratchett, "As you've written books with both Stephen Baxter and Neil Gaiman, who do you think would win in a fight?" TP: What weapons would be available? TP: Steve, I suspect. He's stocky enough, a light build, and probably stronger than Neil. SB: And if Neil were here, I'd tell him that to his face! GR: Goodreads member Hallie Widner asks where "contemporary science fiction is headed in terms of style and theme." SB: It's a strong time for science fiction; it seems like the genre as a whole is coming back, like steampunk. Sometimes people say that we're living in the future, and time's up for science fiction, but I think that never will be, because science fiction really isn't about the future. It's about change and present-day concerns. TP: My beef is that the future isn't happening fast enough. I want to walk into my study in the morning and say, "Get me the work in progress and dial up Dave." And a nice female voice—it would have to be a female voice—would say, "Work in progress: done. Which Dave do you mean? I suspect it's Dave Busby because you were around him three times last week." I believe all the technology for this exists, but no one is joining it up. SB: Another point of view is science as opposed to technology. The universe that we live in now is transformed from when we were kids...the thousands of planets they've detected beyond the solar system. TP: I believe that there are so many possibilities of Earth-like planets in the universe that it's unthinkable that there isn't some kind of life form on them. SB: The planets beyond the solar system look promising indeed, and the sky is full of billions of them. It's the fulfillment of an old dream. TP: The only fly in the ointment is, we might destroy ourselves before we ever get there. We've run out of resources. SB: I once asked Arthur C. Clarke if he was disappointed that 2001 had come [Clarke wrote 2001: A Space Odyssey], and we didn't have bases on the moon and spaceships going to Jupiter and so on. He said, "No, not at all." He argued for it, but he never really imagined that we would have achieved as much as we have. Particularly he was entranced by the satellites that were sent to Jupiter and Saturn. In 2001 the movie, they send a manned craft to Jupiter, but he said the robot to Jupiter was almost as good. GR: The great paradox is that with such scale in the universe, there must be other intelligent life, and yet we can't find any evidence for it. SB: Yes, the Fermi paradox. If they exist, why aren't they here? Why haven't they visited? TP: I can tell you that one. I say we go in a big spaceship and go looking for them. SB: I suppose if we had the capability, we would have done it. If our civilization was 10,000 years older. On the other hand, we are visible to the aliens. You'd need a big antenna, but our leakage radiation could be detected from Alpha Centauri [a star system 4.37 light-years away from the sun]. It's an interesting paradox. I'll tell you the reason, Terry. My reason is: They are out there, but maybe much stranger than we may imagine. Maybe we are more unique than we think. Even if they are technological, they could be technological in different ways from us. GR: Goodreads member Arunjiwa asks, "If you could be remembered for one book, which book would it be? And why?" SB: The Time Machine by H.G. Wells. TP: I think you just might have missed the point. SB: [laughs] Oh, OK. Maybe a book of mine called Evolution. It's about the rise of the primates from the age of the dinosaurs to the present day and into the future. So it's science fiction but on a huge scope. It's used as teaching aids in schools, especially in America as a counter to the Bible story. It was a technical challenge telling a story on that scale. It pushes the form of a novel as far as I think it can be pushed. TP: For my part, it wouldn't be a Discworld book; it would be Nation. I don't think ever before has a book actually grabbed me and forced me to write it. When I was working on Nation, it was like I would reach my hand out for the hammer, and there was the hammer. It just piled through and dragged me after it. I believe it is the best book that I've ever written. GR: Goodreads member Michael Economy asks, "If Terry were to pass away, would he want the Discworld series to continue? Are there any authors whom he thinks are capable?" TP: I know that my daughter could do it, because she has the same way of thinking and writing. Other ones, I don't know. In my career there have been a lot of people who have actually been called the next Terry Pratchett, and then some of them totally disappear because it's a terrible thing to wish on somebody. But if [my daughter] wanted to pick it up, I'd think of that as a family heirloom. SB: I have quite a noisy household, but it's a household of routine. I stick to a 9 to 5, Monday through Friday working day so everyone knows when I'm in my study and shouldn't be disturbed. I like to keep evenings and weekends free. Then Monday morning it's back to work again. TP: It's pretty much like that for me. I wrote thinking that I never would be successful. I thought if I could make some money out of writing science fiction, that would be so good. I never thought I would make a load of money out of it. It's a lot of fun, and I keep wondering when it's all going to end. You keep on doing it because it's your job, but after a while you suddenly realize that it's nice to take a holiday every now and then and actually talk to your wife. These days I try to allow myself some weekends. GR: What authors, books, or ideas have influenced you? SB: The number one for me was Arthur C. Clarke. I really got into science fiction at my school. My school had a big library with an old collection. I just devoured those. Clarke was the one who got me. I went to a Catholic school, but it didn't take with me. What I wasn't prepared for was the big story of the universe that Clarke provided me with. TP: The author who's most changed me was G.K. Chesterton, only remembered now for the Father Brown stories. He wrote many better books, I feel. He introduced me to paradox. He was a great debater. His use of prose was absolutely superb. He wrote some of the best books ever written in the English language. SB: I'm in the middle of Fire in the Stone by a scholar, Nicholas Ruddick. It's a history of prehistoric science fiction. TP: I was recently rereading The Evolution Man, by Roy Lewis. Every now and again it's republished by small publishers, and then it disappears. All those who read it, love it. It's the funniest science fiction book there has ever, ever been. To visualize it, think of the start of 2001: A Space Odyssey and those apes. Just imagine that those apes can talk like Victorian people. "I don't think we're into the Holocene yet." It's got some great lines. I really would like people to get it. I adore Terry Pratchett. It sounds as though he's doing really well. And I endorse his approval of Chesterton, who for a conservative Christian had tremendous flair and style. The announcement of this new project is wonderful news. "Evolution" was a great read. Nation is really very good, I can see why Pratchett rates it so highly. Nation was surprising as it is very different from the Discworld series, yet we find the spirit of Terry Pratchett there. An excellent book, indeed. Apparently the Evolution Man has been published in France under the title "Pourquoi j'ai mangé mon père" ("Why I ate my father")? I should look for it in my local library. Good interview, intriguing book, will look for it too. I submitted a question that wasn't asked of Terry, yet it was answered with his comment regarding Nation--that "never ever before has a book actually grabbed me and forced me to write it." I particularly like knowing that, sometimes, the characters take control of the writing process, and (as I had suspected) books can have lives of their own. Thank you, Mr. Pratchett, for years of reading pleasure. Great interview :) can't wait to read the book and some of the books mentioned as well. Woah I just received and read The Evolution Man reprint 4 weeks ago. And that was after I discovered it after finally reading the first Science of Discworld. Adding a couple of the books mentioned in this interview to my to-read list as they sound good. Nice interview and i enjoyed reading it. I adore Terry Prachett and one of my favorite books is Nation. It is so different from anything out there in Young Adult land and yet it appeals to adults and younger kids as well. One of those books that one person reads it and takes away something and another person takes away something completely different. Wish he would write another like it! Misspepsi wrote: "If I am asked who my most favourite author is I always say Sir Terry Prachett; I love every book he has written and always order his new works in advance; I enjoyed 'Nation' but think that his best..."
I tend to agree. He is underrated, even though much loved, because of the fantasy mode he has chosen to employ and the fact that he is funny. A lot of people just never get that comedy and profundity can coexist. Misspepsi wrote: "As he is an english writer some of his nuances about politics in his novels may not be as evident to readers from other countries but I often see his writings as a reflection on life in the UK. " Personally I see Ankh-Morpork bearing saome resemblance to Singapore, especially how members of its society enjoy street theatre and how Vetinari is somewhat reminiscent of Lee Kuan Yew. Terry Pratchettt is one of my favourite authors! All of his books are a joy to read. His characters are endearing and hilarious. My favourites? Sam Vimes, the witches, Death and Tiffany Aching. Even though I am from Argentina, I can relate with his humor and sarcasm. Can't wait to read this new book. Intrigued by Evolution by Stephen Baxter, and Evolution man by Roy Lewis, I hope I can find them in my country! Oohh... I am glad he mentioned Chesterton. I recently started reading GK and he is brilliant. Dailyalice wrote: "Misspepsi wrote: "If I am asked who my most favourite author is I always say Sir Terry Prachett; I love every book he has written and always order his new works in advance; I enjoyed 'Nation' but t..."
(even named our dog Rincewind as an ho..."
Misspepsi wrote: "Hi Ana, You like the same characters as me; I order Terry's new books the minute I know there's a new one on it's way." Misspepsi wrote: "My favourite characters are the Witches and my grandchildren say that I'm the Nanny Ogg in our family tree some days then on others Granny Weatherwax.Have you seen any of the TV films of the Hogfat..."
No: MUST get hold of them. I volunteer at a library, so shouldn't be a problem. I'm a little older than you Sir Terry and I thoroughly enjoy all your books. Thanks for making an old man feel very happy. Funny, I seem to have heard that before. Dailyalice wrote: "Misspepsi wrote: "My favourite characters are the Witches and my grandchildren say that I'm the Nanny Ogg in our family tree some days then on others Granny Weatherwax.Have you seen any of the TV f..."
I've read everything, literally, this man has written in the past year. I picked up "Going Postal" last summer and I've been in a fever dream ever since, reading one book after another and have now begun re-reading them beginning with "Unseen Academcals". Thank you Mr. Pratchett for gifting us with your talent. Just love Terry Pratchett. He's an author with talent and insight. I second that motion, Pratchett always has the perfect mix of fantasy, humour and insight. Absolutely adore his work, here's hoping for lots more!